Charming Doodle...sew it, build it! : Skirt Week 2013! It's Skirt Week! 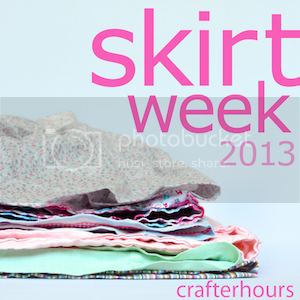 Skirt Week is a fun feature hosted by Crafterhours. This year I decided to enter a few skirts...here's a peek at them. Some of these I'll be blogging about soon. This skirt was one I made for myself last November when I wanted something to wear to Christmas parties. Sadly, my husband is not a fan of this little creation, and I did not wear it. But I kinda love it. It's the most comfortable skirt I've ever had on (thanks to an elastic waistband) and I self-drafted the bubble skirt pattern for it. I took pictures and documented the process of making it (including a SUPER easy technique for gathering this much fabric) so I could share it with you, but when the hubs had such a strong reaction against it I thought maybe you'd hate it too. What do you think? Thumbs up or down? Actually...you don't have to answer that if it's a thumbs down. But if you like it, let me know and I'll get the tutorial up so you can make one too...maybe we'll just look funny (and be comfy) together! I made this combo for Isa today. I had the idea for her shirt, and have been wanting to make her a purple skirt for a while. 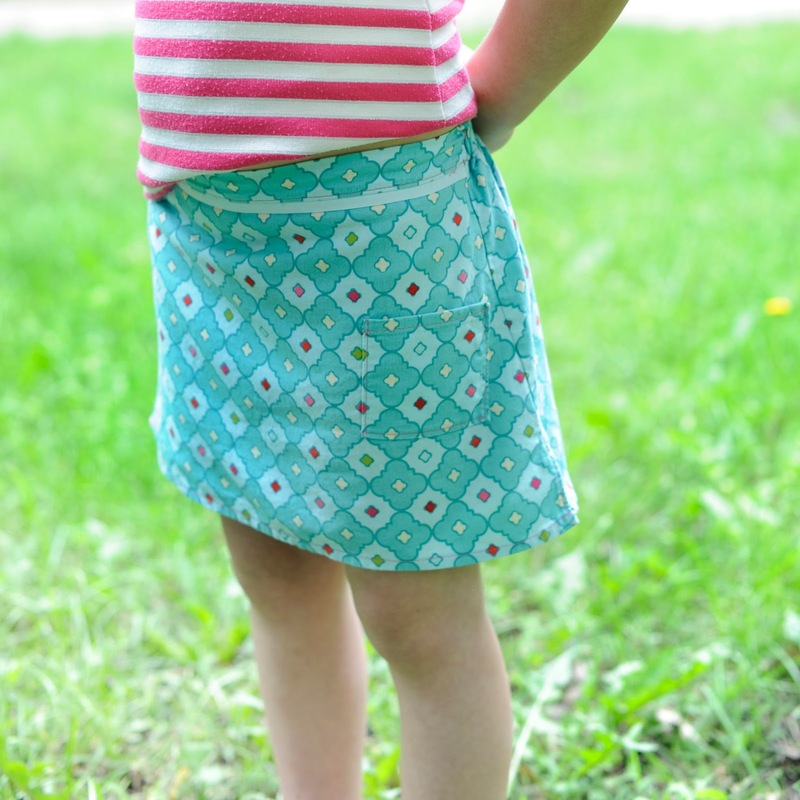 The pattern is called the Dirndle Skirt by Aesthetic Nest. The apron and skirt are supposed to be one piece, but I separated them so each can be worn separately. She loves having a purple skirt...but was quite upset with me that the shirt wasn't purple too. My last submission to Skirt Week was this little number. It's actually a skort that I made as part of my Spring Collection. Yay for modesty on the monkey bars! :) The girls love the idea of 'undercover shorts' that stay their little secret. The pattern is from Peek-A-Boo Pattern Shop and is called the Sporty Girl Skort. 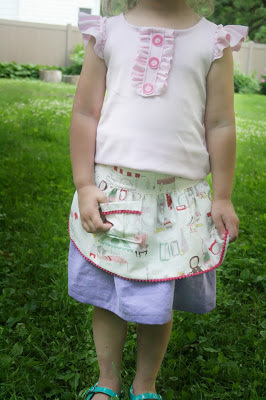 I'll blog more about this skirt in a future post with more collection details. Did you make anything for Skirt Week? Eliz - I do like your skirt, it's got a lot of whimsy to it. I think for a Xmas party it would be fun!